Stop admiring those Moleskin or Rhodia notebooks! 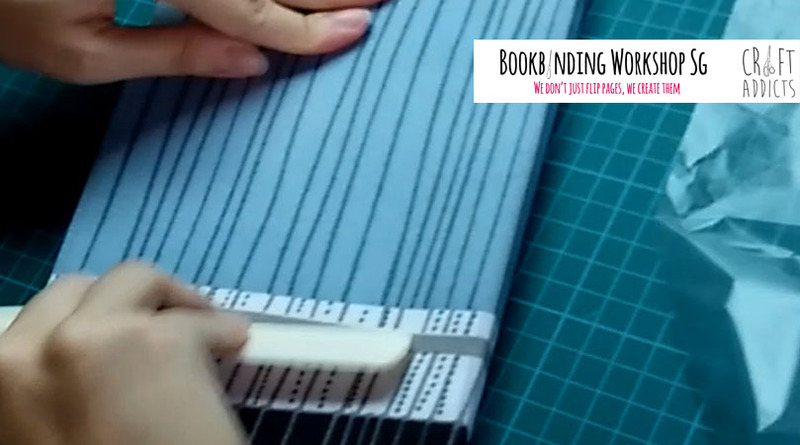 Case binding is a bookbinding method that creates a durable book with a hard book cover, and a covered spine. The book covers can be covered with decorative paper, decorative book fabric, leather and more. The possibilities are endless, it’s up to you to express yourself. The book signatures can be sewn together using Coptic Binding or Saddle Stitch Binding, or they could be bound together with glue using Perfect Binding. You can even add a decorative headband at the ends of the book spine too. 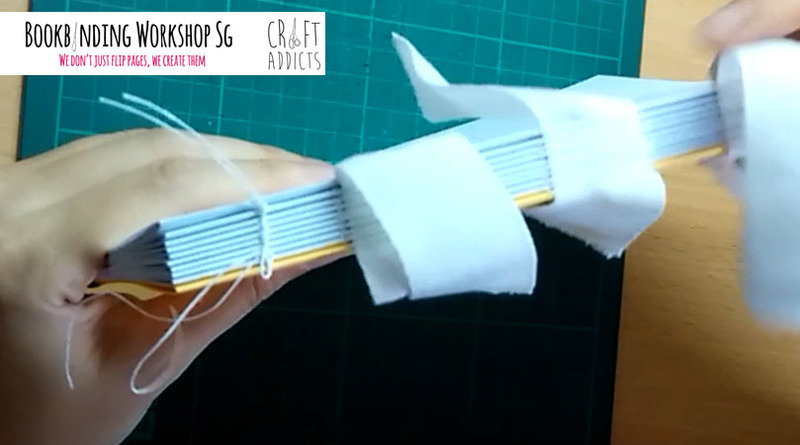 Learn to make a Case Bound Book via our Free Video Course, Click Here To Enroll. 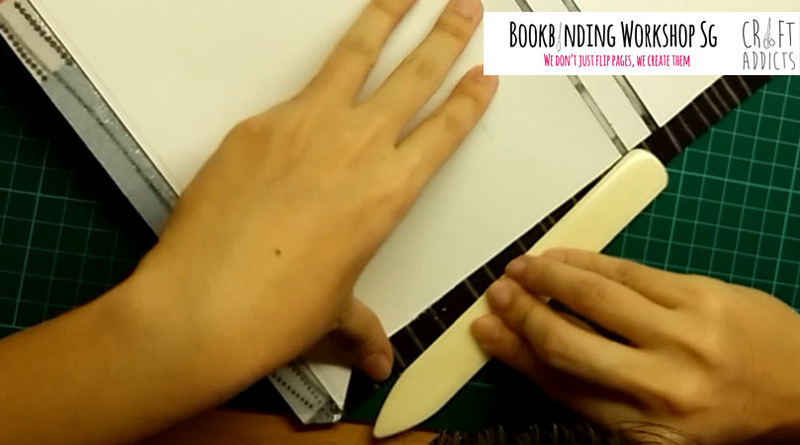 Bookbinding is a hobby that you can go in depth into. There are a lot of fun and complex projects that you can delve into. 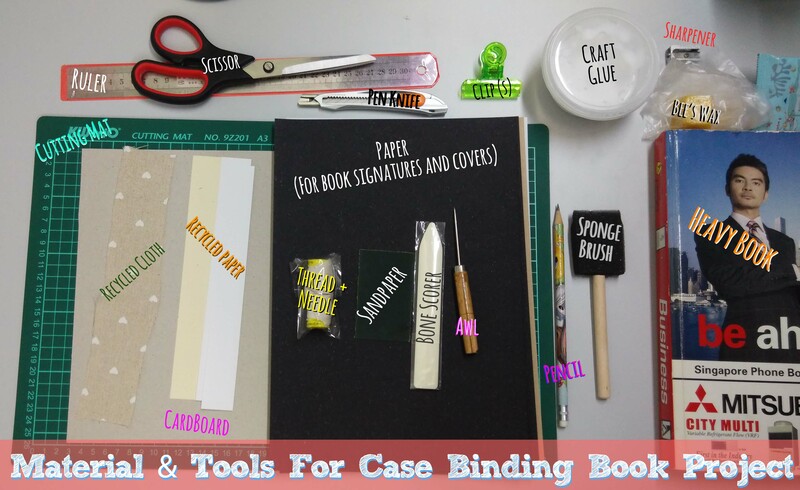 A Case Binding book project involves all the essential bookbinding skills you’d need to complete any other bookbinding project. Hence, I think it is a great book project for new bookbinders or anyone who wants to try out bookbinding. 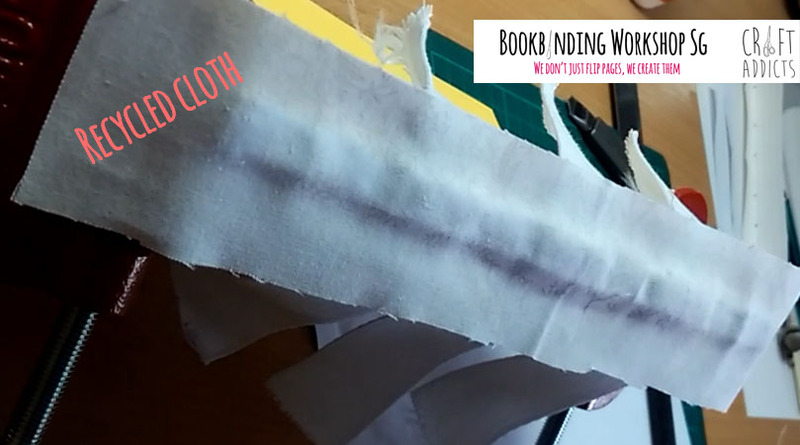 In this step by step Case bookbinding tutorial, we will be using similar processes to that in our Coptic Binding Step By Step Guide. There will be 10 book signatures in this book project. Each book signature will consist of 4 pieces of A4 paper, folded into equal halves. 1. Fold each A4 paper into equal halves and use your bone scorer (get one here) or ruler to make the folds. 2. 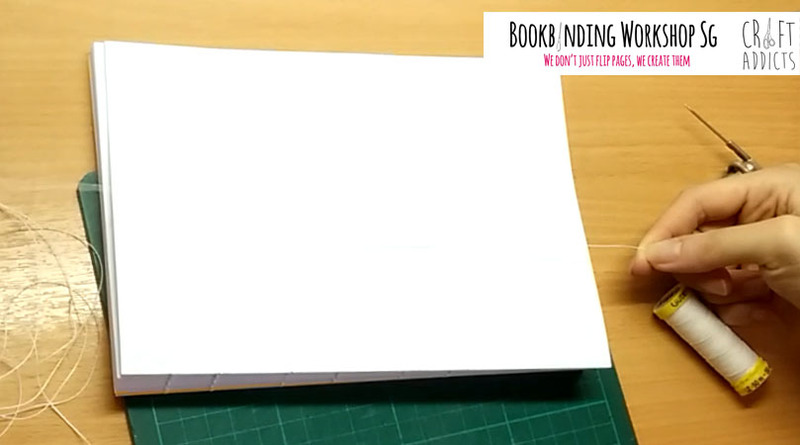 Place 4 of your folded A4 papers together to form 1 book signature. 3. Repeat this for all 10 book signatures. 4. 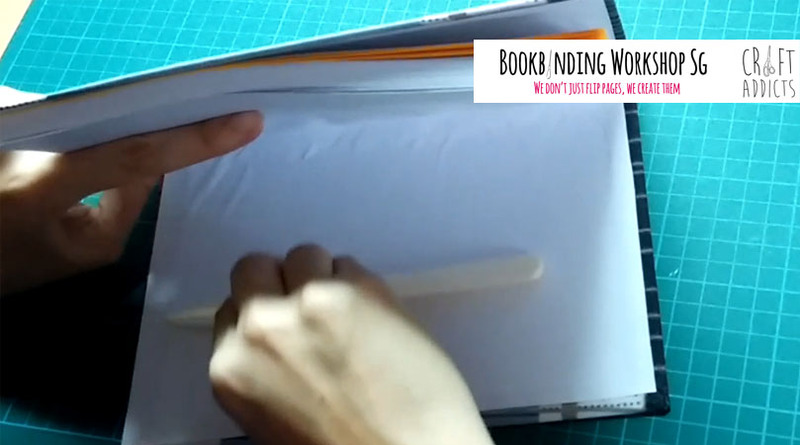 Make 8 holes (of equal distance) along the spine of all 10 book signatures, using your awl. A template should be used to ensure that the holes along all your book signatures line up perfectly. Full details of how to make the template is found in the Free Case binding Video Course, you can enroll here. 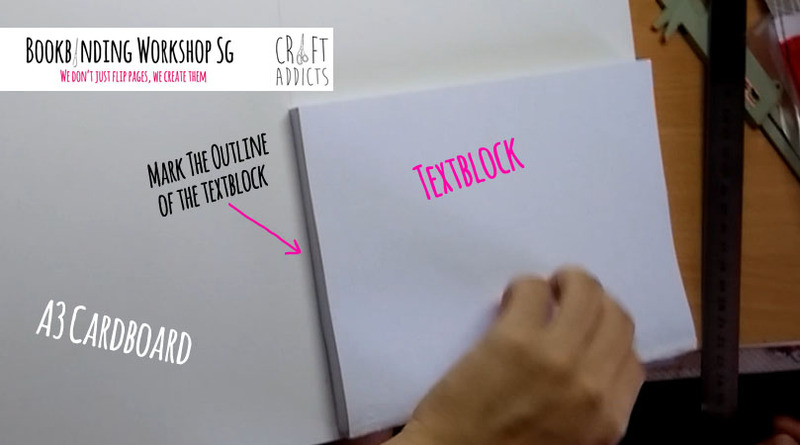 Using 1 book signature as a guide, trace the outline onto your A3 cardboard. Repeat this so that you get 2 book signatures marked out. 1. Gather all 10 book signatures and trace the outline of the book and it’s spine onto the A3 cardboard. 2. You should have 3 rectangular blocks marked out on your A3 cardboard now. 3. 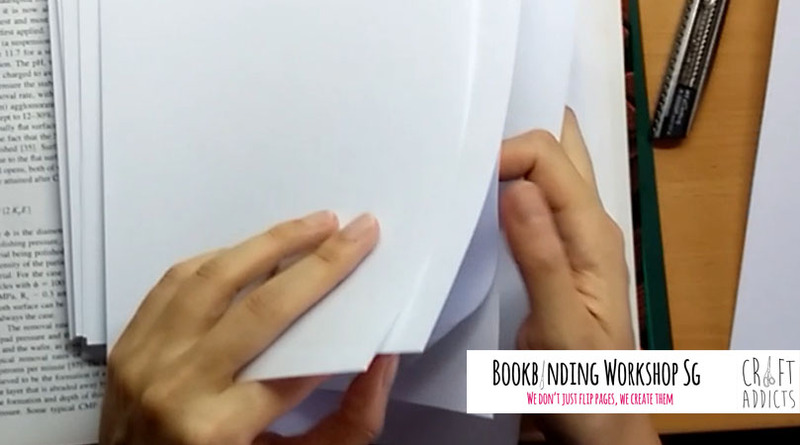 Cut these 3 sections out – these will be used to make your book cover. 4. 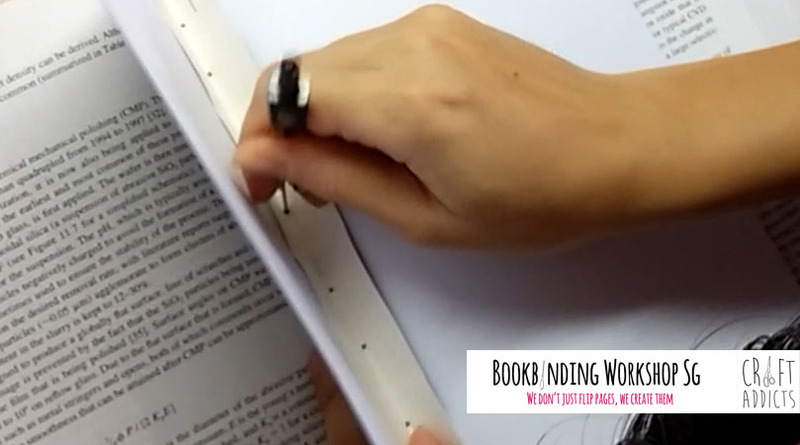 Mark the outline of these 3 sections on the underside of your decorative paper or book fabric, leaving a small gap (~1.5mm) between each section – this will allow easy folding of your book cover later. 5. Using your outline, draw another marking that is about 1-2cm away. This will form your border. 6. 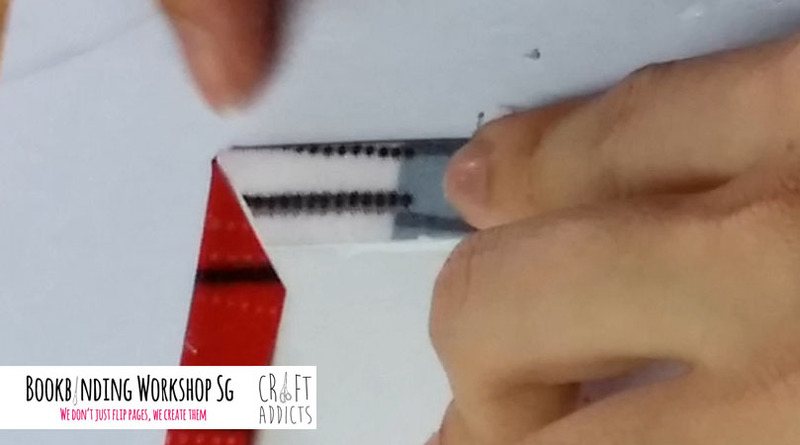 Line these 3 sections onto your decorative paper or book fabric and check the alignment. 7. Cut a triangle off each corner of your decorative paper or book fabric. This will allow you to fold in the borders with ease later. 8. 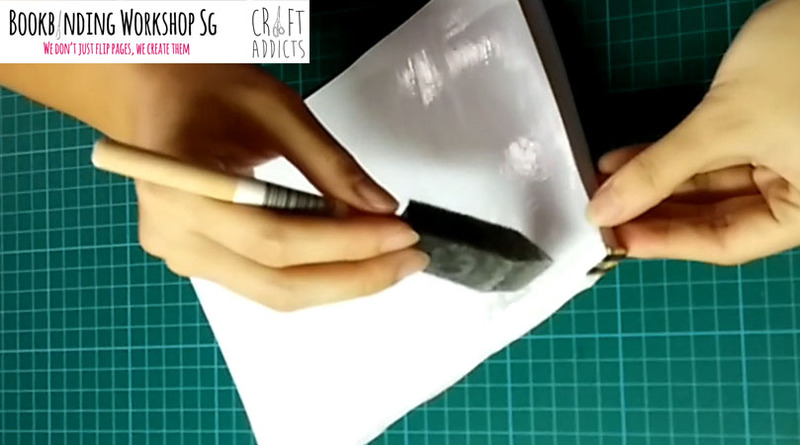 Paste the cardboard onto your decorative paper or book fabric. 9. Fold in the excess borders and glue it onto the card board – use your bone scorer (or ruler) to get rid of air spaces and excess glue. Take extra care of the corners. Make sure that they are folded in nicely. 10. 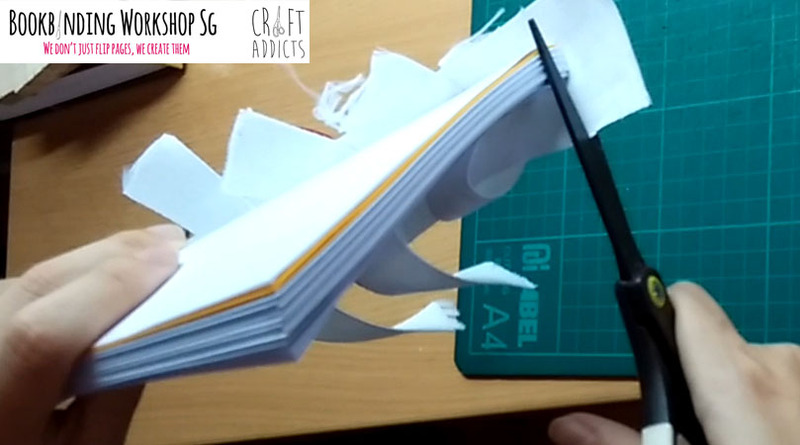 Place the book cover under your cutting mat while the glue dries. In the Case Binding Book Project, the text block (aka book signatures) are sewn together, separately from the book cover. As the book cover dries, it’s time to bind your book signatures together. 1. 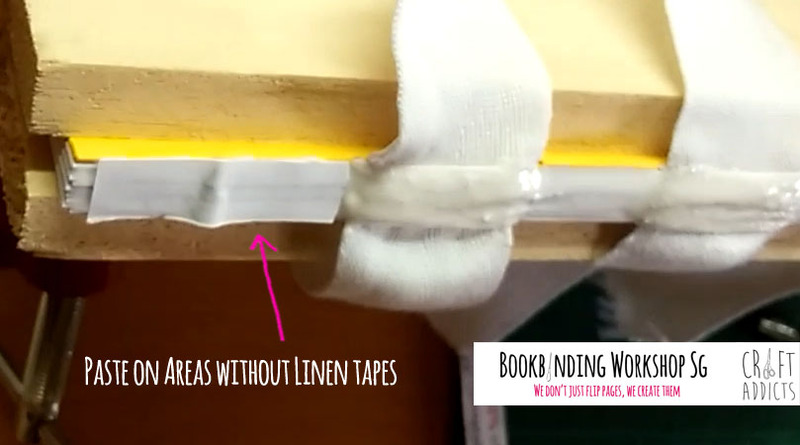 Prepare 3 Linen Tape that are about 3 times the width of your book spine. 2. Prepare thread that is 15 times the length of the spine (of your book signature). 3. Wax your thread using Bee Wax or a candle. 4. Thread you needle, pull the thread through and use both ends of the thread to tie a knot. 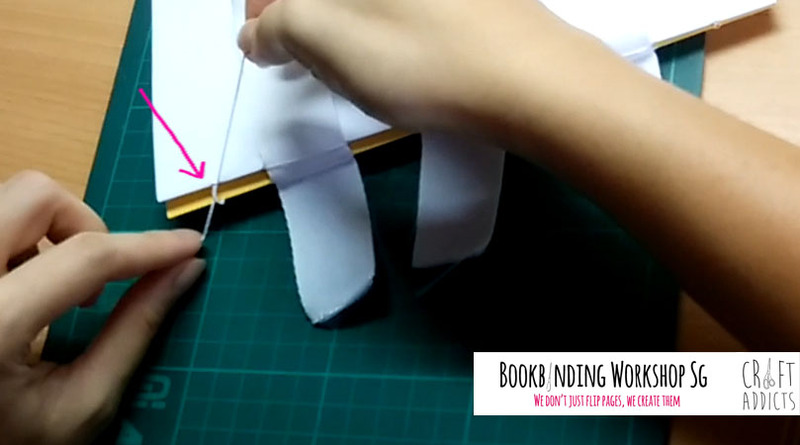 5.Start sewing from the outside of 1 book signature, pull the thread through. 6. 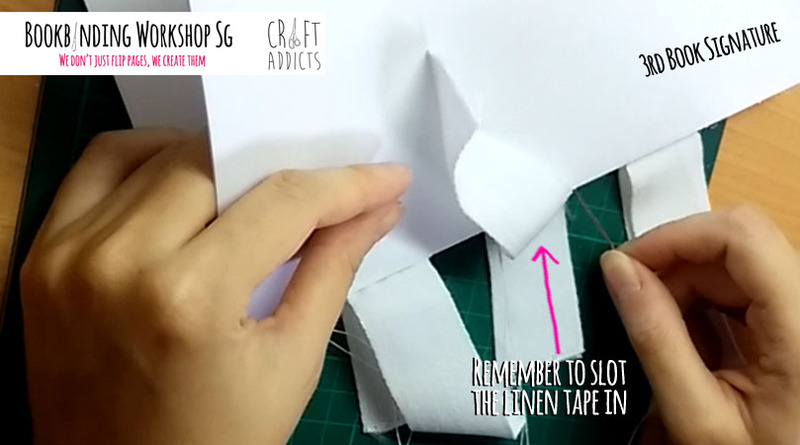 Leave a small length (do not pull the entire thread through the hole please) before continuing to the next hole. 7. 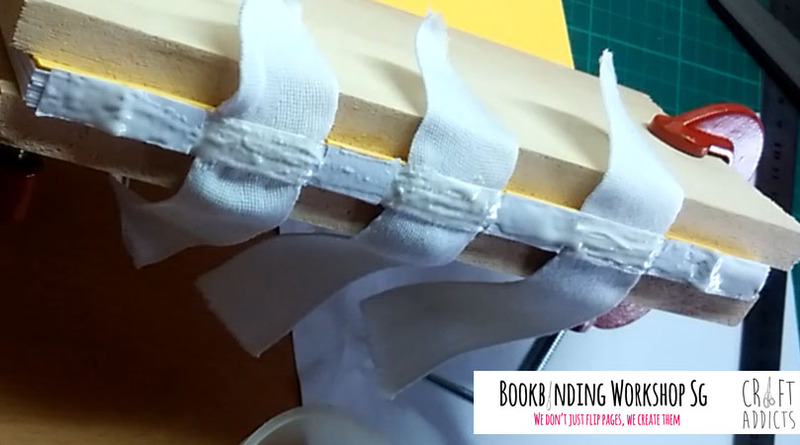 Weave your thread in and out of the subsequent holes, attaching a linen tape each time the thread goes along the book spine that is facing out. 9. At the end of the 2nd book signature, tie a triple knot using the excess thread at the starting end of the thread. 10. Continue to attach the next book signature as you did for the previous ones. 11. 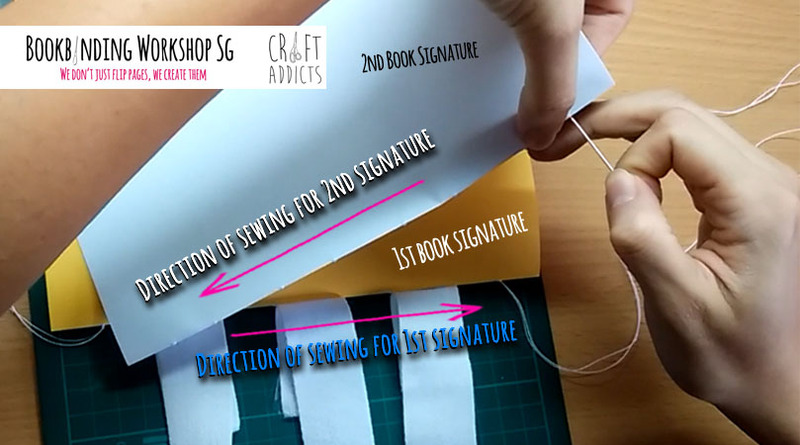 At the end of the 3rd book signature, bring your needle between the thread connecting book sections 1 and 2. 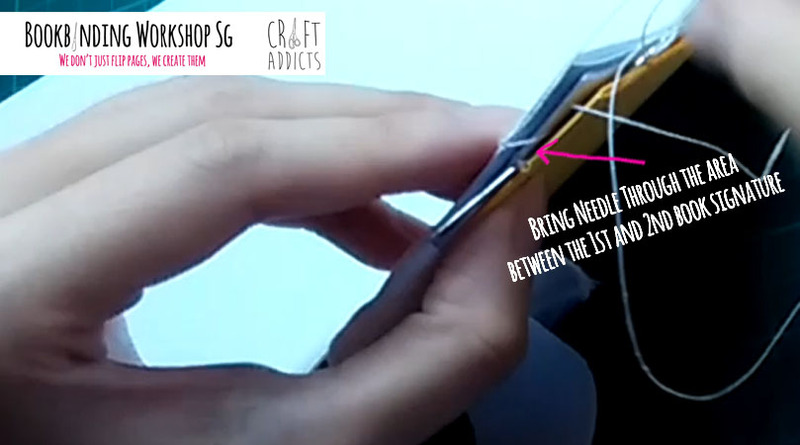 Bring your needle through the thread before pulling it all the way through. This form a knot and holds the 3rd book signature to the first 2. 12. Repeat this until you have bound all 10 book signatures together. 13. 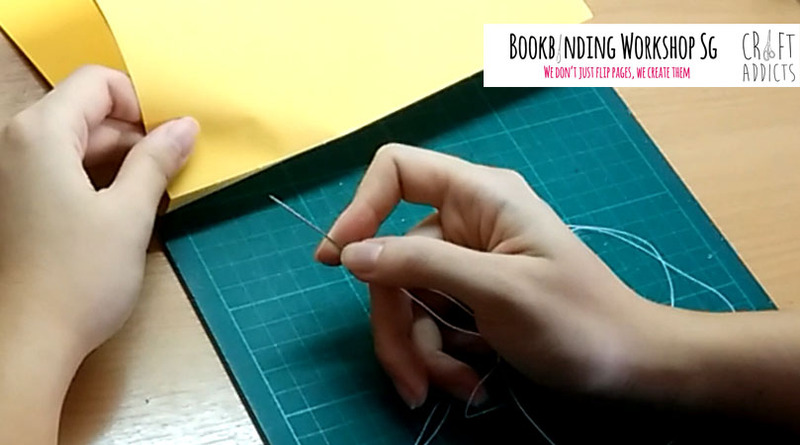 At the last book signature, bind the last book signature to the previous book signatures by bringing your needle around the thread that binds signatures #8 and 9. 14. To end the sewing, tie a triple knot. 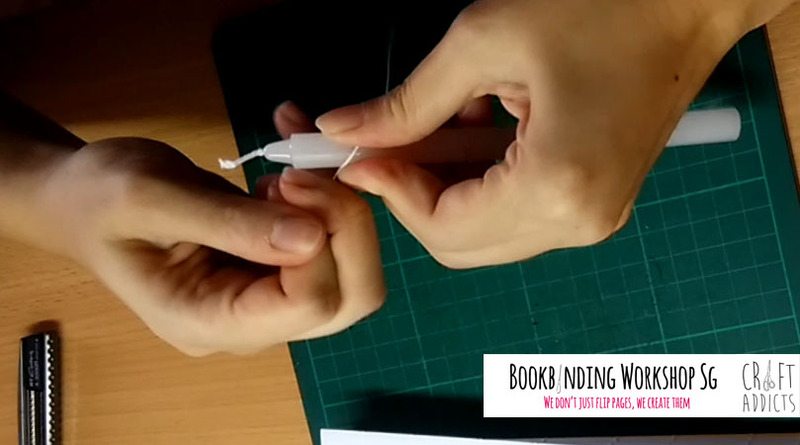 You can do this by bringing the needle around the thread that binds the last 2 book signatures together and bring the needle into the resultant loop that forms. 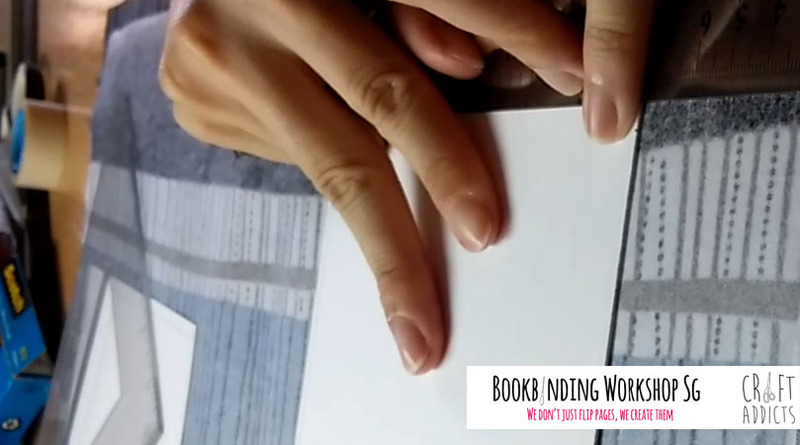 For clearer video instructions, do enroll into our Free Bookbinding Video Course! Once your book signatures have been bound, your text block is completed! Now its time to prepare your book spine. 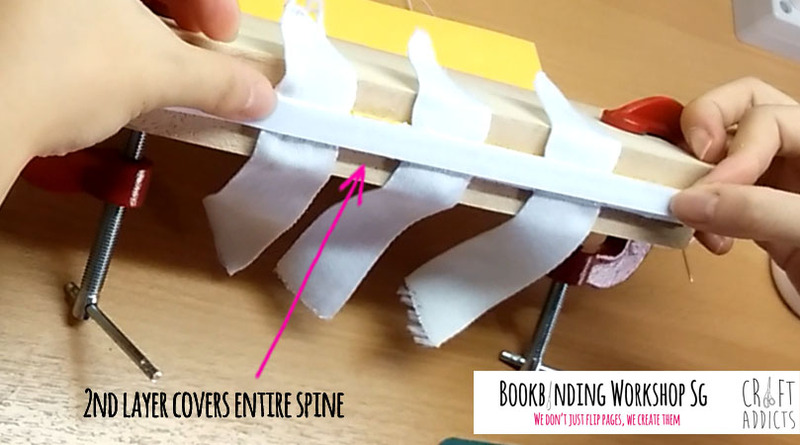 This process will strengthen the book spine and ease the process of gluing the book cover onto it later. Place your text block between 2 heavy books or clamp it up with 2 clamps during this process. 1. 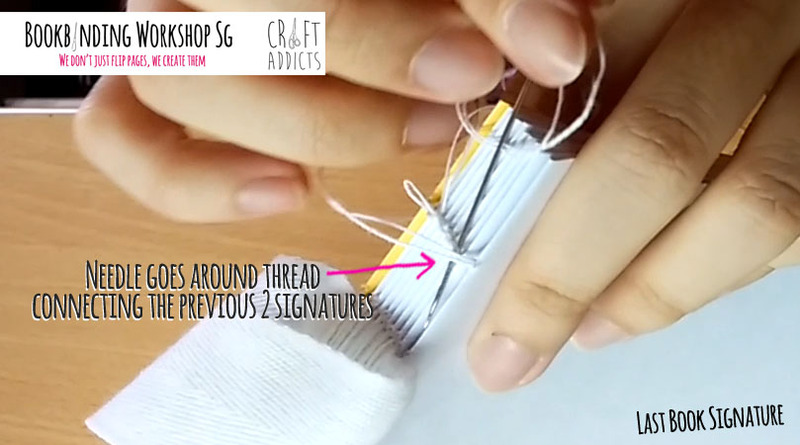 Apply an even layer of craft glue along the signatures without any linen tape. 2. Grab any excess A4 paper from before and paste this onto the signatures. 3. Apply another even layer of craft glue along the entire book spine. 4. Grab any excess A4 paper and paste this along the book spine. 5. Again, apply an even layer of craft glue along the entire book spine. 6. 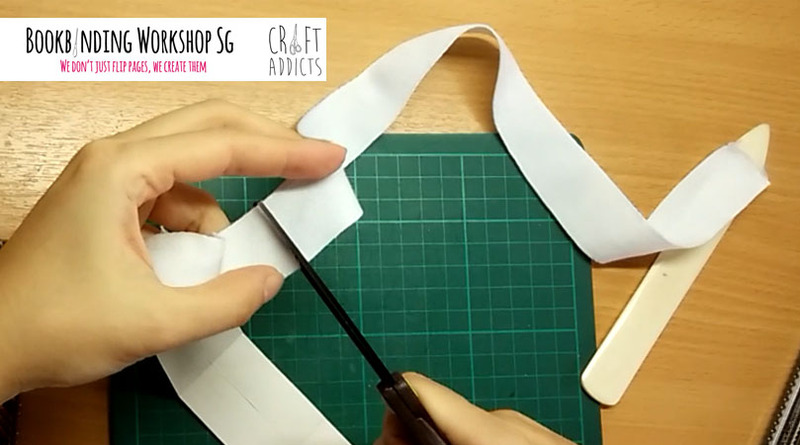 Paste the recycled cloth (can be replaced with A4 paper) over the book spine. 7. Let the glue on the book spine dry. 8. 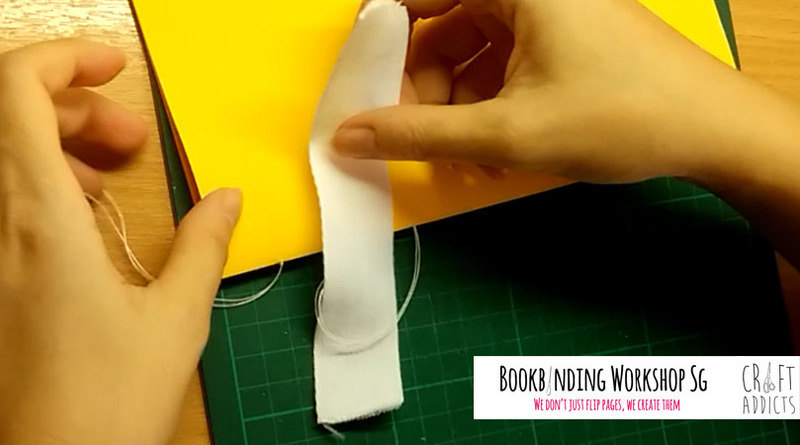 Cut off all excess paper and cloth from the book spine. 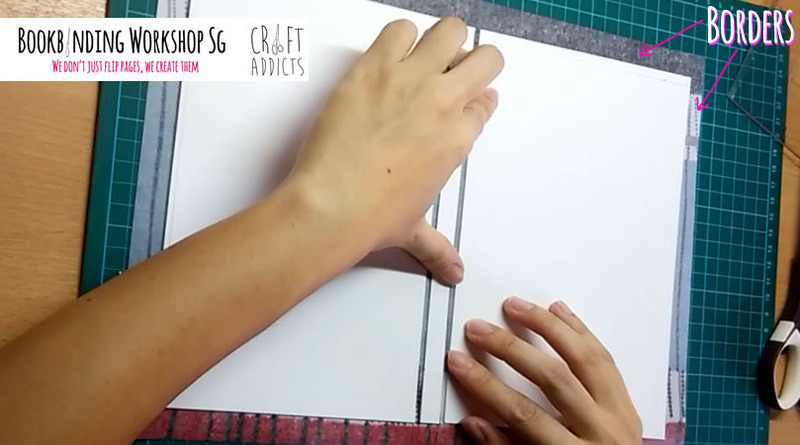 And then, its time to complete your Case Bound Handmade Book! 2. Paste this onto the inner side of your book cover. 3. Use your bone scorer (or ruler) to push any air bubbles out. 4. Repeat step 3 on the inner side of the cover as well. 5. Repeat steps 1 to 4 for the other side of your text block as well. 6. 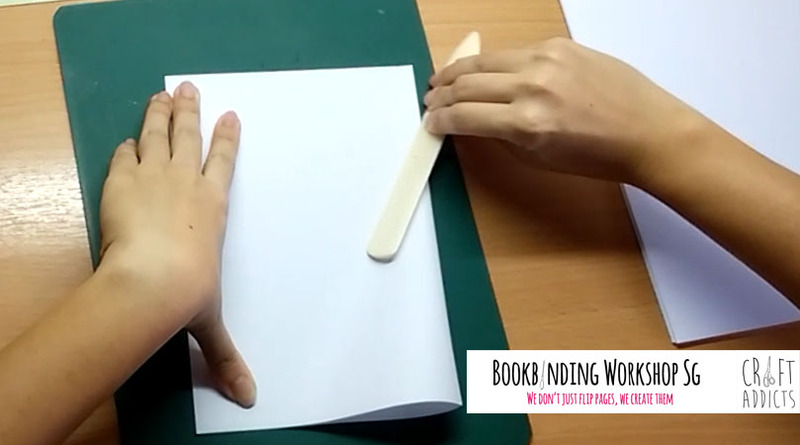 Place your book under some thick books and wait for the glue to dry. And your Case Bound Book Project is completed! Share photos of your final book project with us on Facebook or Instagram!